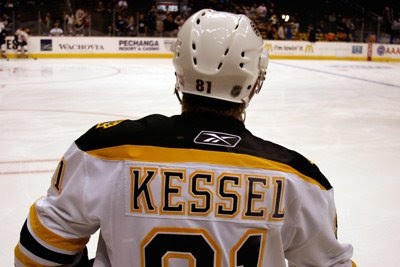 With the addition of defenseman Derek Morris, it becomes abundantly clear that the Boston Bruins have no intention of signing Phil Kessel. Morris' $3.3 million deal puts the Bruins technically, over the salary cap. After scoring more than thirty goals last season, Kessel is looking for Tanguay-type money ($5 million-ish), therefore the Bruins will be selling. As slow as it has been the last two weeks on the NHL transaction front, there will be headlines galore very soon as Kessel and quite a few other big money players will change teams in the month of August. The salary cap era has changed the business of hockey. There are quite a few teams at, near or over the cap who still need to round out their rosters and just as many teams with vast amounts of cap space that will welcome a few big ticket items. Boston: Technically the B's are more than $4 million over the cap. Marc Savard will be an UFA, Milan Lucic a RFA and only 3 defenseman are signed after this season. There is no room for Kessel and another player or two via waivers or trade will need to be moved. Patrick Eaves will be bought out and will then only count about 1/4 of his $1.4 million cap number, but there is more to be done. Chicago: The Blackhawks also are over the cap by more than $4 million. The team faces the task of re-signing Patrick Kane and Jonathan Toews next season. As has been mention before here, Patrick Sharp and his $3.9 million cap number seems a logical choice to move. Sharp will require a serious return in the for of draft picks or prospects. New York Rangers: The Rangers still have more than $2 million in cap room. However, Nik Zherdev's arbitration ruling will either force the team to trade him, or accept his deal and move someone else. Ottawa: The Senators are over the cap by a little less than $2 million. Everyone knows that they have been trying to move Dany Heatley. the Oilers trade seems unlikely now that other teams seem to be in the mix...the ground will shake when this deal does get done. San Jose: The Sharks have less than $600k in cap space. The team has more than it's share of soft, under performing, high-priced forwards and blueliners that they would like to unload. To make matters a little more tricky, they are in need of adding forward depth and have no backup netminder to speak of. A deal must get done. Atlanta, Buffalo, Colorado, Columbus, Dallas, Florida, Los Angeles, Minnesota, Nashville, New Jersey, New York Islanders, Phoenix and Vancouver all have significant money to spend and will be active in pursuing Kessel, Heatley and all others available on the market. Montreal, St. Louis and Tampa do not have the cap space that the others do, but will be active in making deals to improve their clubs.